A break in schooling means only one thing for me: movies! I recently went on a Netflix bender, so I am dispensing of my normal (and very rigid) structure of a certain genre or type of film per day to just tell you exactly what I watched and why, at least in this case, it is so freaking awesome. 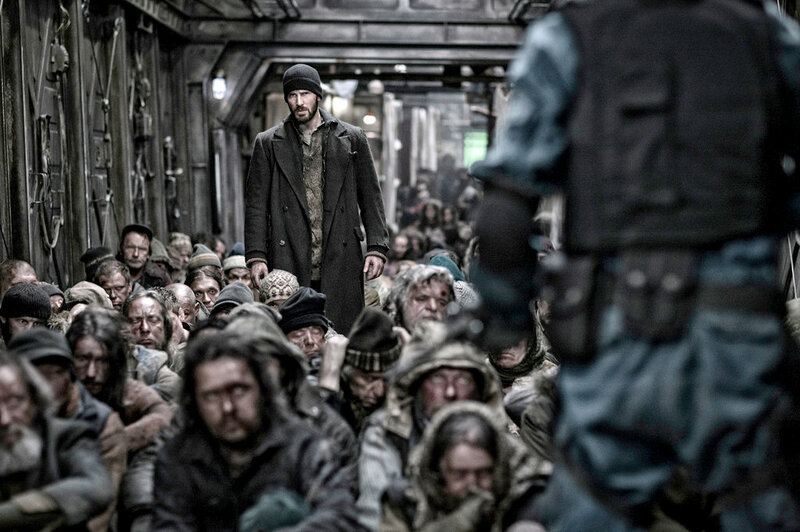 Spoiler alert: Snowpiercer is as cool as everyone else says it is. Just stop reading and go watch it on Netflix already. Seriously, what are you waiting for? Well if you are still with me, I guess I will have to make my case a little bit more clear. Snowpiercer is set in a future where the world’s governments in their infinite wisdom decided to fix global warming by shooting something into space that would cool the Earth’s temperature. Well just like the massive ice block dumped into the ocean by the Futurama crew lead to disastrous results like Bender almost getting killed, this idea froze the entire world. Only the people who were on this super train were saved from utter destruction. But this train is not the savior that all mankind wants. It is instead a caste system with the people who are nearest to the engine are the wealthiest and the ones that closest to the back are the degenerates. They are fed protein blocks that look like jelly blocks and are forces to live literally on top of each other. When they get out of line, a woman named Mason (played very well by Tilda Swinton) comes to the back to tell them of their place and punish the offender by sticking their arm out in the cold so that it will be frozen off. One man, Curtis (played by Chris Pine), cannot abide by this treatment any longer. He organizes an assault on the front half of the train in order to take over the engine therefore controlling the entire train. His journey through each train car becomes more and more deadly to the people who surround him. What makes this movie so fascinating and ultimately worth watching is the complete world that Bong Joon-Ho commits to in this movie. With so other many dystopia, the plot gets bogged down in telling us the details of the world that the main characters live in. However, here Bong Joon-ho trusts his audience enough to understand what is happening and why, and he wants us to something meaningful in the plot, he lets the character discover it instead of telling us outright. For instance when Curtis finds out is really inside of the protein blocks, he looks inside the machine that makes them and is horrified to see what it really is. But he refuses to tell anyone else that hadn’t seen it for themselves. He doesn’t even reveal the secret when he forces Mason to eat one when she is captured by his crew in lieu of some magnificent sushi. He also makes each train car that we see in the movie as distinct from the one that comes before it. Each one serves a purpose that is evident from the moment they enter it, but they all have a grotesque texture to it that reminds me of Delicatessen (1991). Part of the tension lies in not just seeing Curtis succeed but also what lies behind the doors that are being opened by the security expert. It is not always to Curtis’ liking and in fact many times what lies beyond is nothing to be looked forward to. This movie isn’t very subtle. The environment theme is laid bare for everyone to see. The critiques on religion, tyranny, and caste systems are also easy to read. But Bong Joon-ho doesn’t deal in subtlety. He takes these clichéd moments and does them best and twists them in order to subvert your expectations. In a typical Hollywood movie, each person that was introduced at the beginning would have made it to the end or had died in a way that was heroic, but SPOILER ALERT::: only the ones you least expect end up surviving. In a typical Hollywood movie, when the requisite hero monologue that explains his actions happens, I never expect to hear such violent and truly terrible things that Curtis did before he turned into a good person. And finally in a typical Hollywood movie, the ending wouldn’t have been as cynical and lack as much hope as it does here. Each surprise and subversion is what makes this movie worth watching and commenting on. Great review. You are certainly right, Bong Joon-ho’s style is anything but subtle!